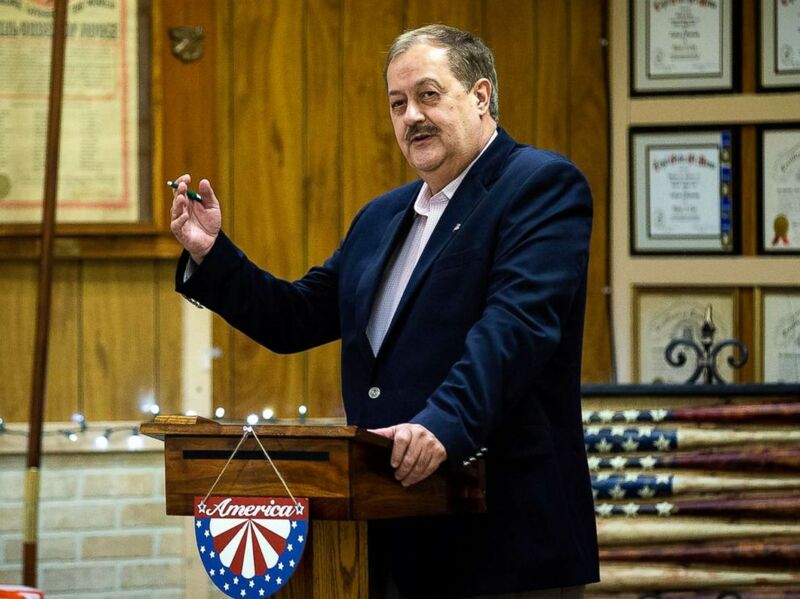 Don Blankenship, a former West Virginia coal mining executive and current Republican Senate candidate, campaigns in Keyser, W. Va., on April 20, 2018. The Democrats' tactic resembles the one used to help Democratic Sen. Claire McCaskill of Missouri win a tough race back in 2012. McCaskill's campaign spent $1.7 million in advertising during Senate GOP primary in favor of Todd Akin, who was seen as the weakest on that ballot. She then snatched the final victory away from him in the general election. Republican strategists say Democrats are at it again in the West Virginia GOP primary, behind a super PAC spending millions to steer the GOP primary in favor of the “unelectable candidate,” as Brian Walsh, a veteran political strategist with ROKK Solutions, a bipartisan public affairs firm, calls Blankenship. National Republicans are working furiously to ensure Blakenship is not their choice to take on Democratic incumbent Sen. Joe Manchin in November. Another group, Mountain Families PAC, backed by national Republicans, has been spending millions on a counter campaign against Blankenship. Other high profile Republicans have weighed in as well with their take on the race. Duty and Country spokesperson Mike Plante denied claims that the group’s goal is to steer the GOP primary in favor of Blankenship. “The Republicans are taking care of attacking Blankenship,” Plante said. Duty and Country’s strategy to target Jenkins and Morrisey, he said, is merely based on their data that indicates that either candidate is going to win the Republican nomination. Plante added that a huge amount of GOP resources have gone into attacking Manchin already this election cycle, and the Democrats are simply fighting back to get help him keep the seat. Walsh, however, said the Democrats' motives are clear. Nominating Blankenship would ensure Manchin’s re-election, and that the Republican leadership is rightfully concerned about his candidacy. FEC records show that Duty and Country PAC shares the same law firm with the Democratic National Committee as well as the party’s two biggest super PACs, Senate Majority PAC and House Majority PAC. Senate Majority PAC spokesperson Chris Hayden declined to comment on whether his group is involved in the operations of the Duty and Country PAC but said that his organization is focused on supporting Manchin in the general election right now. Senate Majority PAC has spent about $2.2 million in support of Manchin so far this election cycle. 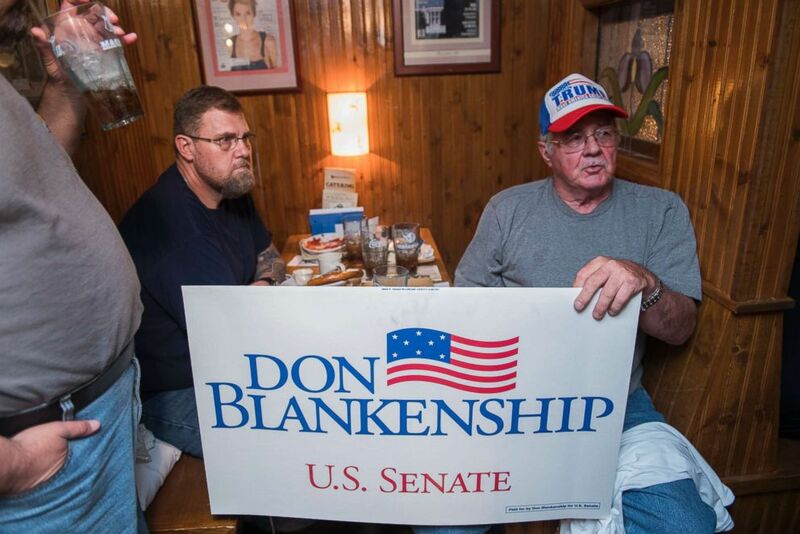 Supporters of Don Blankenship, who is running for the Republican nomination for Senate in West Virginia, attend a town hall meeting at Macado's restaurant in Bluefield, W.Va.,May 3, 2018. West Virginia University political science professor Patrick Hickey said regardless of whether the Democrats are attacking Jenkins and Morrisey with the intention of benefiting Blankenship, it will have the effects of doing so. “I think it’s a smart strategy from the Democratic side to increase the effectiveness of the other candidates’ attacks,” Hickey said. FEC records show that GOP-linked Mountain Families PAC has been working almost exclusively with top Republican consulting firm Main Street Media Group, whose single biggest client is Sen. Mitch McConnell’s super PAC Senate Leadership Fund. Mountain Families PAC treasurer Mike Ottenhoff has worked closely with the NRCC. Hickey said the multi-million dollar attacks against Blankenship linked to the establishment could backfire on the national Republican effort. Blankenship has been vocal about his distaste for the GOP leadership in Washington, calling the national Republicans a “liberal establishment” during a recent debate on FOX News. He also just launched a full-on war against the GOP establishment, calling the Senate majority leader “cocaine Mitch” in a new ad. He later released a statement saying the name referred to allegations a shipping company run by Elaine Chao's father transported drugs. McConnell and Chao are married. The senior Kentucky senator told Fox News he doesn't "have any comment about ridiculous observations like that." Earlier this election cycle, it was thought the rivalry between Jenkins and Steve Bannon-backed Morrisey would result in an aggressive GOP primary. 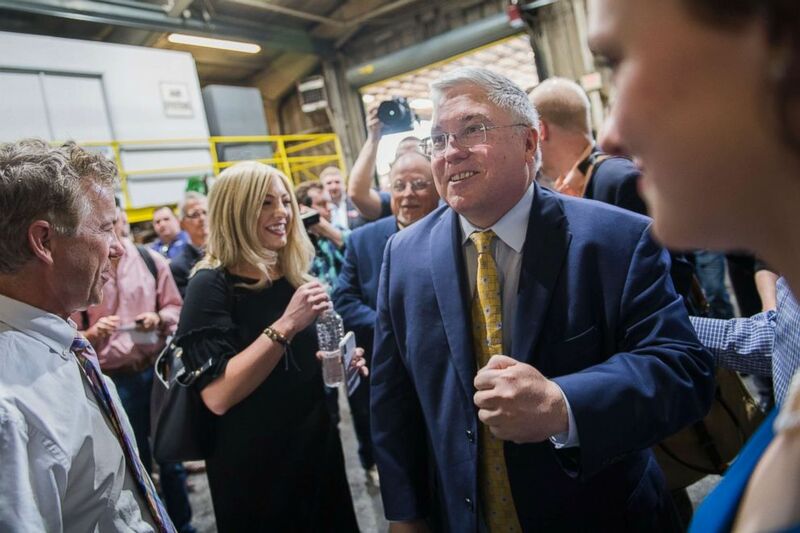 Patrick Morrisey, right, who is running for the Republican nomination for Senate in West Virginia, attends a campaign event with Sen. Rand Paul, R-Ky., left, at Richwood Industries in Huntington, W.Va., May 3, 2018. Meanwhile, some of the top Republican donors have been backing Morrisey. A super PAC called the 35th Inc., backed by big name Republican donors including Richard Uihlein, Bernard Marcus and the Koch Industries, has spent $844,266 supporting Morrisey and attacking Jenkins. The single biggest political contributor this year, Uihlein is also behind two other super PACs bankrolling ads in support of Morrisey -- Americas PAC and Restoration PAC. WATCH LIVE ON TUESDAY: You can watch livestreaming coverage of all the primary action starting at 7 p.m. ET on ABCNews.com or on the ABC News app available on the Apple App Store, Google Play Store, Apple TV App Store and Roku Channel Store.